Built 2L [email protected] TT long block E85 700hp! | @40psi - 790hp! I just finished this really awesome pieced together HTA86 powered Turbo Trix built 2L engine. 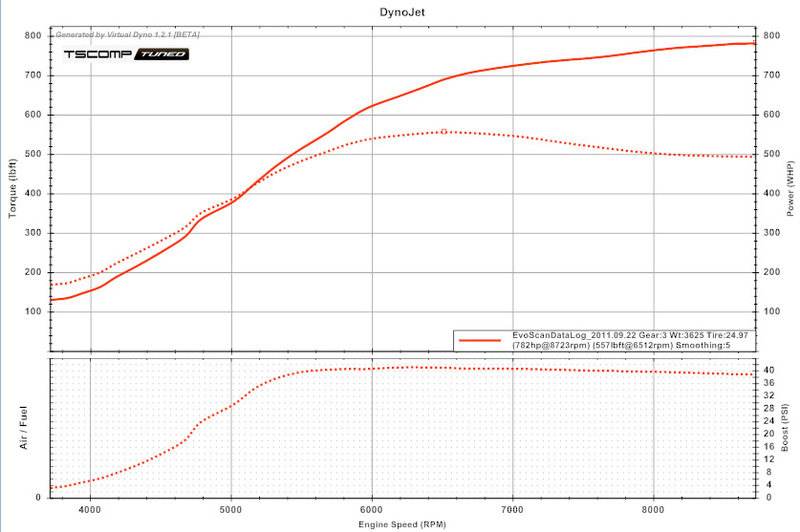 This is a perfect example how combination is a major key in producing wicked power out of these cars.. this car might make 800whp once were done with high boost.. i will update later with that graph also. Hopefully we hit 800 on high boost mode! Btw this was in 97% humidity! Will update graphs once we get a good night for tuning. 40psi currently. still 3rd gear run also. Also still only reving out to 8500ish.. car has the capability to rev to 9500rpm safely. Last edited by tscompusa; May 9, 2013 at 11:17 PM. Wow great job. 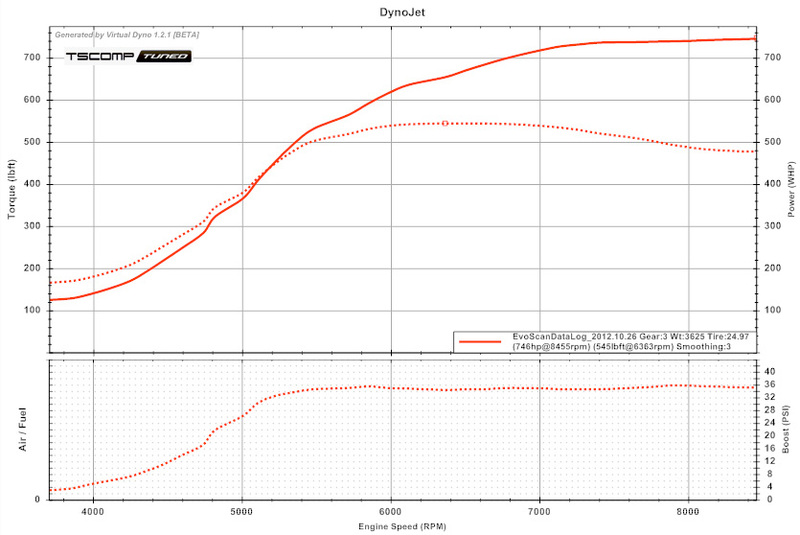 Got vids on dyno? would love to hear this beast! guy's name isn't travis is it? Yet again Tom does a great job tuning a car...My car is no where near this build but he did the best out of three tuners I have tried. Good Job Tom keep it up!! p.s. Hi Pete, sorry I didnt make it to LG when you came up. I had some family things going on unfortunatly. I look forward to the next time, The RS is my favorite. Last edited by Stradag; Sep 21, 2011 at 12:01 PM. Awesome power for 33psi, very nice. Should hit 800 awhp at 40-42 psi. Also that Turbo Trix head sounds like it's doing work! Last edited by bostonhatcher; Sep 21, 2011 at 02:21 PM. When you hit it around 3k it hits full boost around 5k. its pretty decent for a 2L and the power its producing. it made well over 750 so far. ill post the graph once were 100% done with it.. but i think it might see 800 below 42. To all others - thank you. Yes that's the guys name Pete. Last edited by tscompusa; Sep 21, 2011 at 03:18 PM. yea i figured it was, i called him right after i made the post.. the car is on a fast track to making some power. nice work. travis was telling me about the whole sceneario and i couldn't agree anymore. great numbers man!! do you like the speed density conversion alot more? im becoming more familiar as i read about it. Sounds like a much better way to go. update! just hit 790 in 65F temperatures with high humidity!!!! in 3rd gear!!!! This car has 830 in it in 4th i bet if not more. This is 40psi. 4th gear pull def is over 800 whp. My budget is 6262bb but I want an hta86 the spool is so much more superior and top end. Well it hit ~715 hp at 33 psi. Quick Reply: Built 2L [email protected] TT long block E85 700hp! | @40psi - 790hp!